The experimentalist phenomenon of 'noise' as constituting 'art' in much twentieth-century music (paradoxically) reached its zenith in Cage’s (’silent’ piece) 4’33. But much post-1970s musical endeavour with an experimentalist telos, collectively known as 'sound art', has displayed a postmodern need to ’load’ modernism’s ’degree zero’. 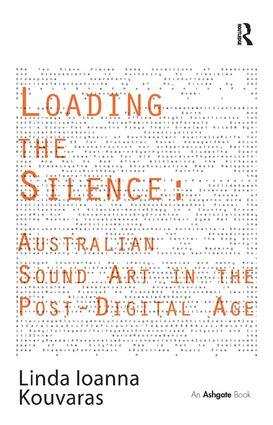 After contextualizing experimentalism from its inception in the early twentieth century, Dr Linda Kouvaras’s Loading the Silence: Australian Sound Art in the Post-Digital Age explores the ways in which selected sound art works demonstrate creatively how sound is embedded within local, national, gendered and historical environments. Taking Australian music as its primary - but not sole - focus, the book not only covers discussions of technological advancement, but also engages with aesthetic standpoints, through numerous interviews, theoretical developments, analysis and cultural milieux for a contemporary Australian, and wider postmodern, context. Developing new methodologies for synergies between musicology and cultural studies, the book uncovers a new post-postmodern aesthetic trajectory, which Kouvaras locates as developing over the past two decades - the altermodern. Australian sound art is here put firmly on the map of international debates about contemporary music, providing a standard reference and valuable resource for practitioners in the artform, music critics, scholars and educators. Dr Linda Kouvaras is a Senior Lecturer at the Melbourne Conservatorium of Music, The University of Melbourne, Australia.